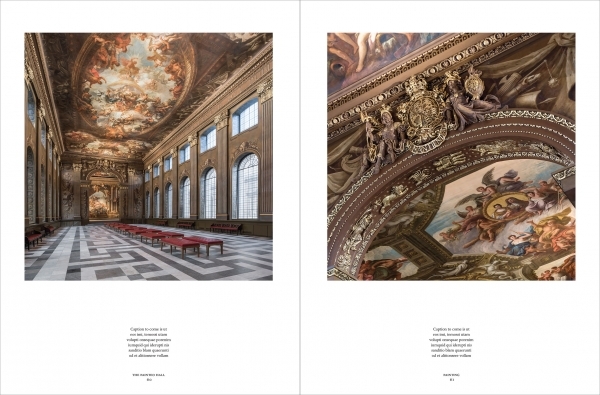 Published to mark the reopening of the spectacular baroque interior of the Old Royal Naval College in Greenwich after a landmark conservation project, The Painted Hall is a wonderful celebration of what has been called ‘the Sistine Chapel of the UK’. 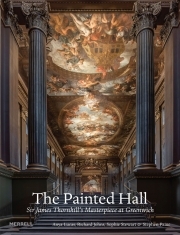 The ceiling and wall decorations of the Painted Hall were conceived and executed by the artist Sir James Thornhill between 1707 and 1726. The artist drew on a cast of around 200 figures to tell a story of political change, scientific and cultural achievements, naval endeavours, and commercial enterprise against a series of magnificent backdrops. In the first part of the book, Dr Anya Lucas describes the history and architecture of the building and the background to Thornhill’s commission. The grandeur of his composition reflects the importance of the space that the paintings adorn: the hall of the new Royal Hospital for Seamen. The Hospital was established in 1694 at Queen Mary’s instigation for men invalided out of the Navy, and was designed by Sir Christopher Wren and Nicholas Hawksmoor. The passage of nineteen years from the start of the commission to its completion, and the need to navigate contemporary political events, meant that Thornhill was required to rethink the design of his paintings several times. When he had finished his work, he wrote An Explanation of the paintings, which was published by the Hospital directors and sold to visitors. This guide is the subject of the second part of our book, by Dr Richard Johns. 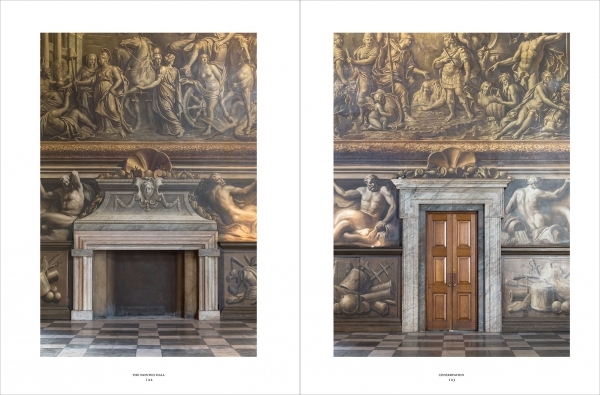 Johns also explores image and meaning in Thornhill’s decorative scheme, which stretches across three distinct but connected spaces: the domed Vestibule, the long Lower Hall, and the Upper Hall, together presenting a compelling picture of Britain’s place in the world according to those who governed it at the start of the 18th century. 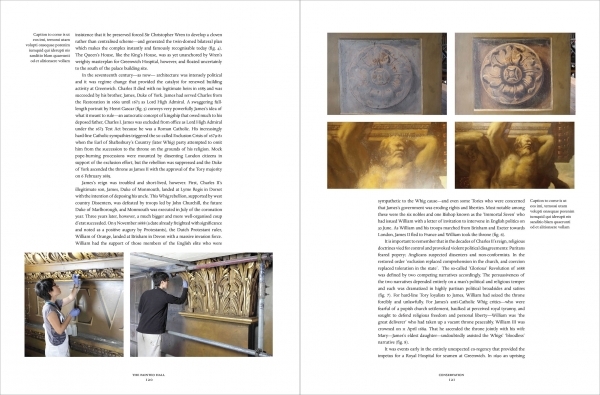 In the final part of the book, the specialist conservators Sophie Stewart and Stephen Paine consider historic restorations of the Painted Hall from the 18th century to the Ministry of Works campaign of the late 1950s. The spring of 2019 sees the completion of a ground-breaking conservation programme that has ensured the long-term preservation of the paintings. Now that every inch of decorated surface has been lovingly cleaned and conserved, new photography brings the colour, clarity and vibrancy of Thornhill’s masterpiece to life. 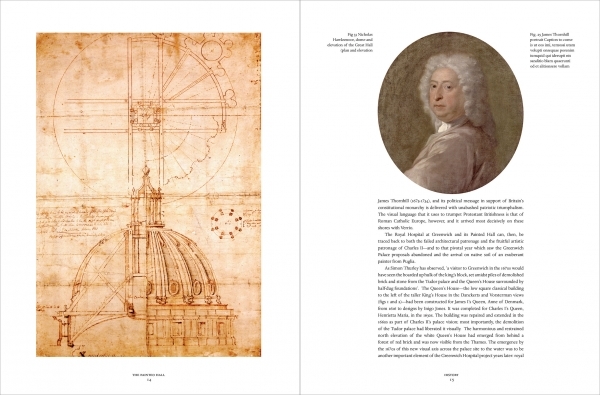 Dr Anya Lucas is an art and architectural historian specializing in 17th- and 18th-century Britain. She wrote her PhD at the Courtauld Institute of Art (2015) on the Livery Halls of London and is co-author of Merrell’s book on the subject, published in 2018. She has also written for Country Life magazine and The Georgian Group Journal, and contributed to the book Court, Country, City: British Art and Architecture, 1660–1735 (2016). 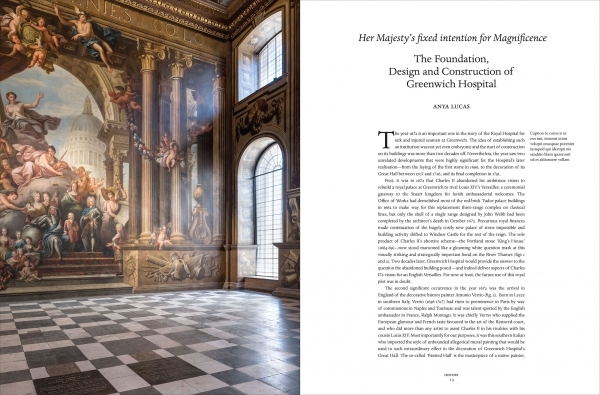 She most recently worked as Research Curator for the major conservation project at the Painted Hall. Dr Richard Johns is a Lecturer in the History of Art at the University of York and a former Curator of Art at the National Maritime Museum, London. He has published widely on British art of the 18th century, including the grand-scale decorative history paintings of Sir James Thornhill and his contemporaries. He was a member of the advisory panel convened to advise on the conservation of the Painted Hall. Sophie Stewart studied archaeology, anthropology and history of art at New Hall College, Cambridge, and then gained a diploma in conservation from the Courtauld Institute of Art/Getty Conservation Institute. In 1992 she completed a Getty Conservation Institute post-diploma internship, leading to the award of a Courtauld Institute of Art Certificate of Advanced Practical Training in the Conservation of Wall Paintings. She worked as a wall-painting conservator at English Heritage until 1999, since which time she has worked in private practice in partnership with Stephen Paine. Stephen Paine studied history of art at University College London and subsequently obtained a diploma in conservation from the Courtauld Institute of Art/Getty Conservation Institute. In 1992 he completed a Getty Conservation Institute post-diploma internship, leading to the award of a Courtauld Institute of Art Certificate of Advanced Practical Training in the Conservation of Wall Paintings. He has since worked as a private conservator, working on many significant wall paintings of all periods for a wide variety of clients in the UK.